MyDraw for Mac OS is a powerful diagram designer, providing all the functionality needed for creating professional flowcharts, organizational charts, network diagrams, floor plans, mind maps, workflows, UML diagrams, electrical diagrams and a lot more! MyDraw has been designed to provide powerful diagramming software which is easy to use and not overwhelming. With completely customizable user interface and neatly organized layout users can get started with MyDraw in just seconds! With MyDraw any flowchart, organizational chart, mind map, network diagram, floor plan, workflow, UML diagram, electrical diagram, data flow diagram can be styled to look absolutely amazing. MyDraw offers a vast number of formatting features including multiple fill styles, Photoshop-like effects, control over transparency on every aspect of the shapes and a lot more. 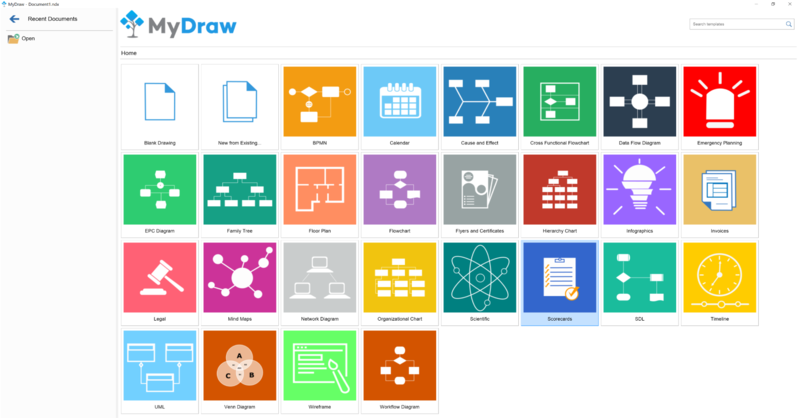 MyDraw comes with a collection of ready to use templates for various diagrams. Users can see all templates library and use any diagram template absolutely free! MyDraw offers detailed Getting Started Guide and How To topics with screenshots, covering both basic and advanced functionality within the software as well as many tips and tricks that can help make diagram designing an easy and enjoyable task! Release Notes: MyDraw Diagramming Software for Windows and Mac v2.0 has been officially released and is now available for download! The new version comes with a lot of new features including new file formats, new shape factories, new diagram templates, AutoSave functionality, and Multi-monitor support. You can be the first to write a review of MyDraw for Mac!